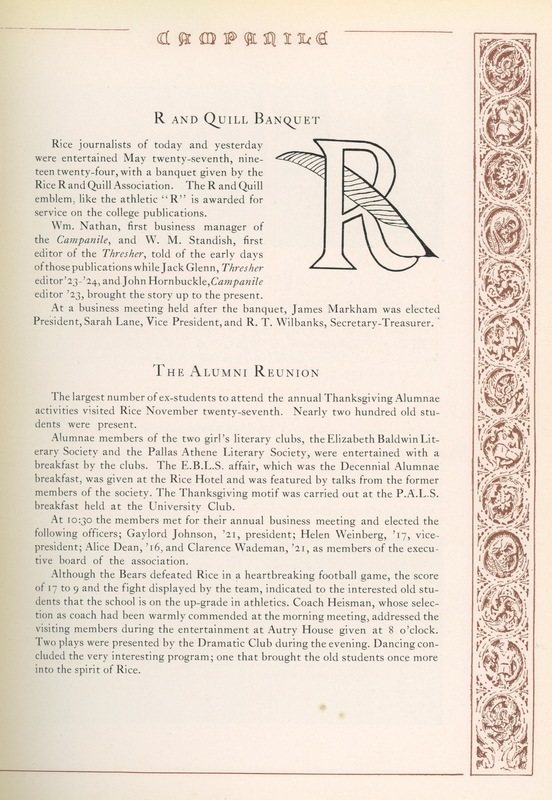 I included the section on the R and Quill banquet because I like the insignia but as I read it I realized that it’s actually more interesting than the reunion, which is notable only for the attendance figure (200) and the false hope surrounding Coach Heisman. I can’t recall ever hearing of the R and Quill Association: does it still exist? Also note that I’ve written about several of the people mentioned in the article: William Nathan, Sarah Lane and most surprising to me, R.T. Wilbanks, twice. By the way, I’m taking a couple of days off for the holiday. I’ll be back Monday. This is the first I’ve heard of the “R and Quill”. I worked at The Thresher during the 76-78 academic years. Here is an “R and Quill” banquet in 1947. I don’t see any “R and Quill” mentions later than the list of activities in Rice’s 1956-58 General Announcements (p. 38) (http://scholarship.rice.edu/bitstream/handle/1911/35979/riceuniversityge195658hous.pdf?sequence=1).